Combine visits to Orient Beach and Maho Beach, with transportation in between, on this 5-hour tour in St Maarten. Spend two hours at each beach relaxing, watching the jet liners land, or participating in water activities (own expense). Find your way to the EDC Lot (Sand Bank), located just outside the Philipsburg cruise port, for departure at 9am. With your guide and group, climb into an air-conditioned van and drive to the first beach stop of the day: Orient Beach. You'll have two hours at Orient Beach to relax and swim, or sign up for some watersports and activities. Jet skiing, paragliding, SUP, boogie boarding, and other activities are available (own expense). Back on the van, head for Maho Beach, more commonly known as Maho Beach. Upon arrival, check out the sign at Sunset Beach Bar and Grill, which lists the day's arrivals and departures. Listen to the communications from the control tower over the bar's audio system and get ready to see jet liners up close as they fly directly over the beach. After two hours at Maho, head back to your original departure point. We had a great time in St. Maarten visiting both beaches. Our tour guide was fabulous and allowed us the most time at both places. I would strongly recommend staying longer at Orient Beach. The beach is bigger, less crowded and very clean. However, once you arrive you will be approached frequently with locals to buy merchandise or a massage. Once they pass it's a very relaxing place. 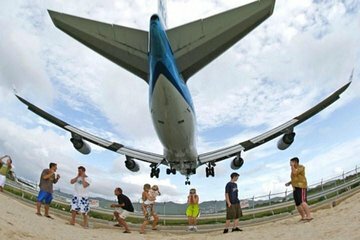 Maho Beach is worth going to to see the airplanes, but it is very crowded. This beach is better to visit later in the afternoon, 2:00 and after once the crowd dies down. We had plenty of water, soda, beer and Rum punch provided by our driver to last us the entire trip. Great Day! !